It’s been awhile. Today I had planned to blog about what an amazing year 2014 was, why I’ve been away from the blogosphere for so long, and my plans for 2015. All these things still ring true, but can wait for another day. Like most members of the media — and dare I say, most people with hearts and minds — the attack on the French satirical paper Charlie Hebdo left me feeling physically ill. That twelve people could die simply turning up to work in modern-day Paris seems unbelievable. Instead of blogging about the future, for once, I’d like to stop and reflect on the work of these satirists, while also remembering the lives of the police killed in the attack. Killing satirists and commentators does not kill debate. It simply inflames it. 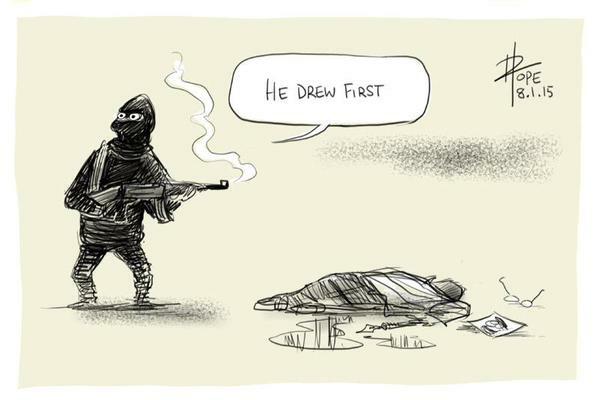 I think this heartbreaking cartoon by Australian cartoonist David Pope sums up today best. Such a terrible loss of life! The artists’ response to the absurdity of the attack is so powerful because the aim was not a group of cartoonists, but the freedom and tolerance that is so central to our (admittedly idealistic) concept of democracy.